In this richly detailed and eye-opening book, Rick Wartzman chronicles the erosion of the relationship between American companies and their workers. 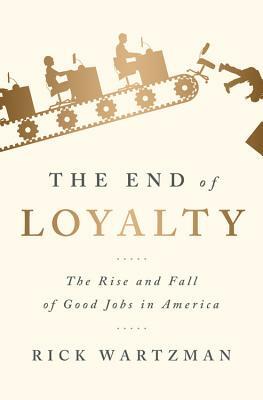 Through the stories of four major employers--General Motors, General Electric, Kodak, and Coca-Cola--he shows how big businesses once took responsibility for providing their workers and retirees with an array of social benefits. At the height of the post-World War II economy, these companies also believed that worker pay needed to be kept high in order to preserve morale and keep the economy humming. Productivity boomed. But the corporate social contract didn't last. By tracing the ups and downs of these four corporate icons over seventy years, Wartzman illustrates just how much has been lost: job security and steadily rising pay, guaranteed pensions, robust health benefits, and much more. Charting the Golden Age of the '50s and '60s; the turbulent years of the '70s and '80s; and the growth of downsizing, outsourcing, and instability in the modern era, Wartzman's narrative is a biography of the American Dream gone sideways. Rick Wartzman is director of the KH Moon Center for a Functioning Society at the Drucker Institute, a part of Claremont Graduate University. He also writes about the world of work for Fortune magazine online. Before joining the Drucker Institute in 2007 as its founding executive director, Rick worked for two decades as a reporter, editor and columnist at The Wall Street Journal and Los Angeles Times. While business editor of The Times, he helped shape a three-part series on Wal-Mart's impact on the economy and society, which won the 2004 Pulitzer Prize for National Reporting.